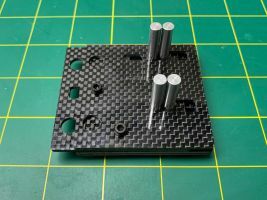 Mr Grippy is extremely well thought out with a spring loaded sliding action; Carbon Fiber construction and supplied with rubber 'feet' to stop him sliding around on your workbench - He grips! He has 2 pairs vertical alloy posts to clamp your wires in place, these posts have a 1 inch gap between each pair - allowing you plenty of working space. But that is not all! 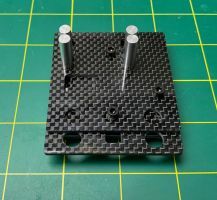 Next we have a rectangular self-clamping slot - this slot allows the jig to firmly hold male or female XT60 or Deans connectors in place making for neat and easy soldering. Last but not least there is a pair of round holes to suit bullet connectors, making soldering ESC's or Battery connectors a breeze! Caution: Carbon conducts electricity - Never place 2 plugs from the same battery pack in Mr Grippy simultaneously or he will get very hot under the collar! !